If reviewing Scotch Tape means I’m out of ideas, then call me out of ideas (I do have plenty more things to look at, though). But really, who doesn’t have a use for tape? And when buying that tape, couldn’t shaving off several pennies save quite a bit of money over time? Is the brand name really worth it (It’s pretty generic-sounding, now, isn’t it)? Let’s see. 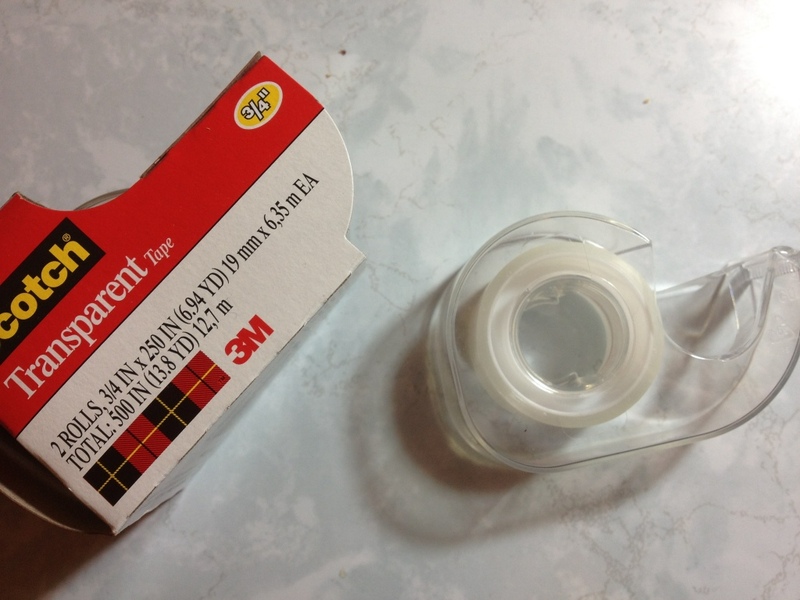 First thing, the container: Scotch Tape comes with a clear plastic, simple, but quite durable dispenser. The roll of tape is clicked into place on the wheel and at the front are several teeth for separating the tape into strips. Is any of this the best quality? No, but it gets the job done, and very cheaply. If one has a tape dispenser that they like, individual rolls can be bought, so I’d say that this works quite well. Now onto the tape itself, which certainly isn’t “magic” or “invisible”. The stuff I’m looking at is just labeled “transparent”, and that it is. The tape is easy to see through and sufficiently sticky that it will hold most documents together without a problem in either holding or reading. In fact, the tape itself is very strong, and the adhesive is more likely to break than the tape itself (or perhaps what it’s taped to). Given that it does have a certain rigidness to it, though, it isn’t a tape for repairing any item that, like a tool, will be used, or will move. It is surprisingly strong, but really only good for paper products. Now, is it worth it to buy Scotch Tape and not some other tape? Given how inexpensive Scotch Tape is already, I’d say yes. And if it isn’t right where you’re shopping, I’d even hunt around for it. The two rolls that come in a pack for around a dollar will last for quite some time. And I’ve seen other brands for around the same price that cease to be sticky once they came off the roll. In short, there’s a reason we say “Scotch Tape” and not “transparent adhesive tape”. This entry was posted in Beginner Supplies, consumables and tagged art supply, art supply critic, review, scotch, scotch tape, tape, transparent adhesive tape by Dragon Co (Austin Smith). Bookmark the permalink.